This is a sample of one of the many dolls i have created, there will be more updates, aswell as more pictures and infomation on how to purchase a doll. Im the creator of Dekadent Dolls My name is Lauren Burrows and i come from Milton Keynes. I have been doing Dolls since i was 16. 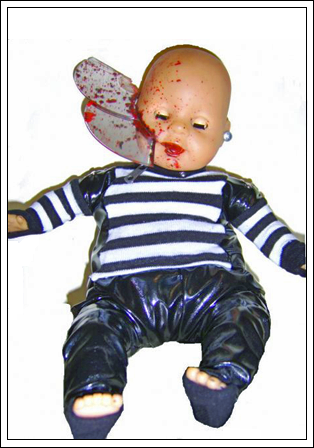 Dekadent dolls are for ADULTS and not a CHILDS TOY. I make dolls my very own creation. They all vary from some grusume , goth, fetish, or some of you might jst prefer the cute one's to look at. I personally like to create the gory dolls as I find I enjoy doing them ones more. I have been creating dolls for a few years now. having many comments on my art work from pleasant to nasty comments. I dont find nasty comments offensive as it will just feed me to do more just to piss you off. DO NOT ENTER THIS SITE IF YOU ARE EASLIY OFFENDED! !